Microsoft chairman Bill Gates has revealed that the computing company isn't just working on one tablet device but "lots of different ones". This comes after Microsoft revealed that the much-mooted Courier tablet concept - and potential rival to the Apple iPad - would not be released. Speaking to Fox Business Network, he revealed that Microsoft was looking at a number of different tablet devices and that it's not all about the touchscreen either – with Gates still trying to pioneer the pen as a stylus. "Microsoft has a lot of different tablet projects that we're pursuing," explained Gates and when pressed about the use of a pen with a tablet, he said: "We think that work with the pen that Microsoft pioneered will become a mainstream for students. "It can give you a device that you can not only read, but also create documents at the same time." The pen stylus is something which was meant to come with the Courier tablet. 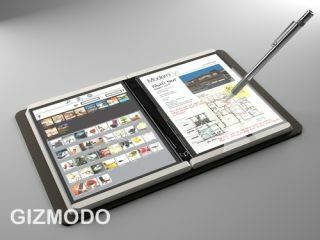 While Microsoft has revealed It has "no plans" to build the device, elements of its design may well find its way into other tablet devices, with Microsoft's corporate vice president of communications, Frank Shaw saying last week: "It's in our DNA to develop new form factors and natural user interfaces to foster productivity and creativity. "The Courier project is an example of this type of effort. It will be evaluated for use in future offerings, but we have no plans to build such a device at this time." No plans, eh? Tell that to Mr Gates.